Here’s a first look at what is most probably the official seal of The Capitol from The Hunger Games. Check out the photo in the gallery here! This seal looks to be at the back of the Capitol Coal Car which we posted earlier – you can see that one here. A perfect blend of the current seal of The United Nations, it also has a twinge of a Mockingjay – or actually the US’s national bird, the bald eagle. What do you think? ^ Bulle, I was merely talking of the first glimpse, but thanks for the info! This makes much sense, given the style of Panem’s government. 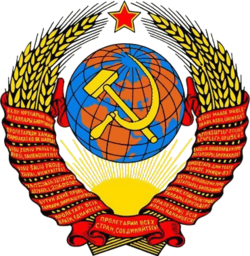 That’s not the UN, that’s a communist symbol. 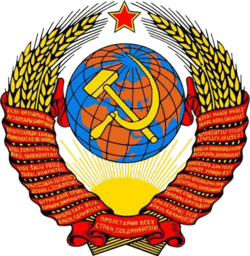 The UN has olive branches, but the crossed grains were used a lot in the socialist soviet republics. That’s interesting – it does look like the US national bird BUT instead of arrows in one claw and an olive branch in the other (always looking toward the olive branch in the seal) it has arrows in both claws. Nice touch. Previous Previous post: "Expect big things from The Hunger Games, a series of FOUR action films"